Whether you use the space in your garage as simple storage or a workshop, you’ll want to find garage storage solutions that help maximize your square footage. Don’t let your two-car garage become a catchall for things that simply don’t have a place in your home. Instead, intentionally plan and design a garage with storage solutions that work for you. 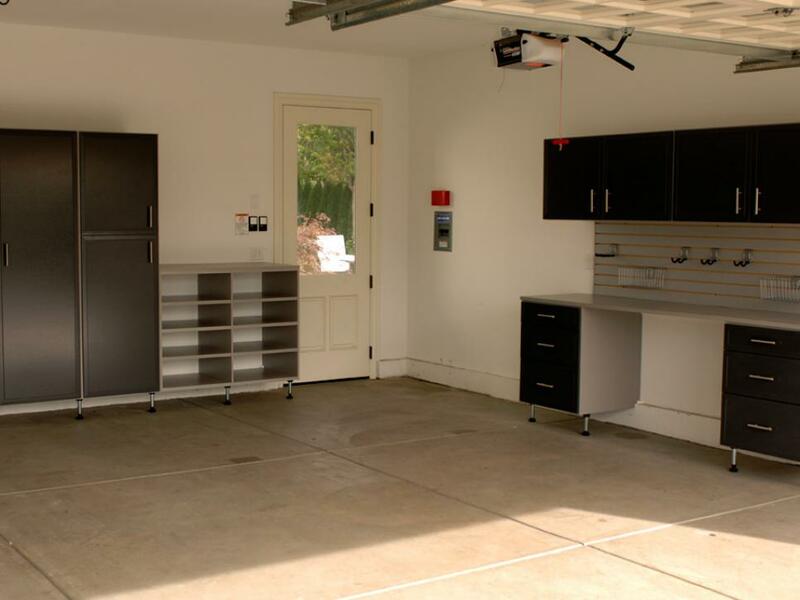 Use these simple tips to help you get your garage organized and in working order. Maybe this seems obvious, but you should start by sorting out everything currently in your garage and everything that you would like to store in your garage. Sort into piles of related items—like belongs with like. This means that Christmas decorations go with other Christmas and holiday décor, while garden tools go with garden tools. Part of sorting is purging. If you have not used an item in the past year, it may be time to let it go. Sorting will help you separate what you need from what you don’t. It will also help you assess what you might need to add to your garage for storage. There are many options to consider for shelving in your two-car garage. You want to add enough shelving for your needs without covering every wall. You also want to allow room for a workbench and space to hang tools. Storage lockers, drawers and shelves are all good options for garage storage. While it may be tempting to simply stack bunches of boxes, this may not be the best option. When you need an item, you don’t want to spend time sifting through a pile of boxes. Instead, consider intentional storage, that is, storage where you know what’s in each location. Open shelving or clear containers will allow you to see what is in each storage area. Another solution may be as simple as well-planned storage and a good label maker. Consider visibility as well as accessibility for any frequently used items. Seasonal items may be locked away, but things you reach for often should be easily accessible. As with many storage challenges, you can “make” more space by adding vertical storage options. Use all your floor-to-ceiling wall space in your garage. Add shelving and other storage. You may also consider cabinets and storage bins. Depending on the construction of your garage, you may even be able to add storage in the rafters. Ceiling hooks may be a helpful option. Heavy duty hooks are a great way to store bicycles, kayaks and other seasonal sporting equipment. Also, large items (such as wheelbarrows and ladders) can be hung so that they don’t take up valuable floor space in your garage. If you want to keep your garage as clean as possible, then you want to avoid tracking in dirt. Particularly if you are not using your garage to park your car, then using floor tiles is a great way to add flair to your garage and keep you from tracking in dirt. Of course, basic door mats also help. You likely need a workbench in your garage, but it may seem to take up too much room. One good solution is a fold-down workbench. This gives you the option of having the workbench set up when you need it but having space available to park your cars when you aren’t using the workbench. It’s a great way to make the most of your space. Another option is a mobile workbench on casters. This allows you to roll out the workbench to the middle of the garage when you’re using it and tuck it away when you aren’t, allowing for space to park your car or storage for other objects. Of course, you want your garage to be functional, but it can be more than just utilitarian. Consider painting your garage in bold colors. Take your garage from clean and tidy to fun and funky. You may want to add some artwork, such as framed posters, to your garage. In some cases, the items you store can double as decorative pieces. A collection of snowboards, for example, if mounted just right can add style to your otherwise boring garage. It’s great if you can combine form and function in your two-car garage. You may want to consider non-traditional lighting options. Add light fixtures that you’d normally associate with your home rather than industrial-type lighting. This can create a homey atmosphere in your garage and encourage you to keep it neat and organized. Your two-car garage is more than just a place to park your vehicles. It’s a storage area, a workshop and maybe even your favorite place to play. Considering the many functions that your garage may have, you want to make it more than clean and functional. Choose storage options that fit your needs and your lifestyle. Also, find ways to maximize your storage space, whether that be vertical storage, ceiling hooks, and other ceiling storage or adding shelving and locker-style storage. While you cannot change the square footage of your garage, you can create more storage space by maximizing what you do have. If you’re interested in purchasing high-quality garage storage for your home, then be sure to call or message us today!